"With more turntable users forgoing traditional amplifiers and the growing feature sets of powered speakers, we saw a need for an appropriate link between turntable and powered speaker." - P. Hahn, Turntable Lab "We built and listened to three RIAA circuits with unique component values. Once tightest EQ response was achieved, we selected Nichicon Muse series coupling capacitors and WIMA film capacitors for equalization circuitry" - J. Hopper, JDS Labs KEY FEATURES preamp works with MM cartridges gold plated RCA inputs + outputs 1/4" TRS headphone output (adaptor not included), note: headphones with inline control will need special adaptor to work with 1/4" input input impedance: 47K Gain (MM, Line-Output): 35dB Gain (Headphone Output): 35+7=42 dB RIAA EQ Curve Accuracy (20-20kHz): +/- 1 dB Power Supply: 15VAC, 500mA Headphone Amp Gain: 35+7=42 dB Headphone Amp Noise: (Limited by RIAA) -103 dBV Headphone Amp Output-Z: < 1 ohm Headphone Amp Output Power: @ 32 ohms 56 mW Headphone Amp Output Power @ 600 ohms 42 mW 4.4" x 4.3" x 1.2" / 112 x 109 x 30.5mm 0.6 lbs / 9.3 oz Power supply included. 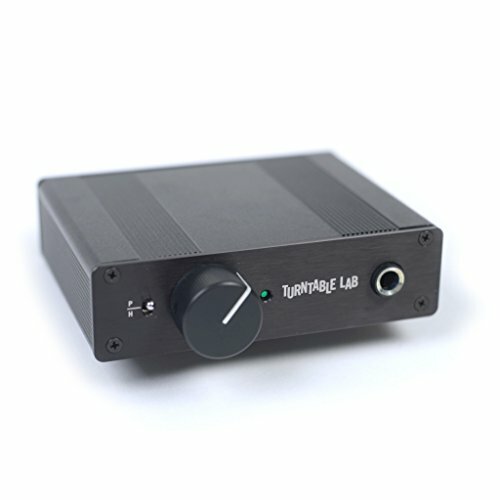 If you have any questions about this product by Turntable Lab, contact us by completing and submitting the form below. If you are looking for a specif part number, please include it with your message.